Mix together all ingredients for the meatballs. Form into small meatballs and arrange evenly in a casserole dish. Bake meatballs for 10 minutes. While meatballs are baking, prepare curry sauce by heating oil in a frying pan over a medium-high heat. When the oil is hot, add onion and saute for 2-3 minutes. Add remaining curry ingredients. Bring to a simmer. After meatballs have baked for 10 minutes, remove from oven and cover with curry sauce. Bake for an additional 7-10 minutes. While meatballs are baking, prepare cabbage salad by combining all ingredients in a bowl. Mix well. Serve meatballs and salad with a side of cauliflower rice, brown rice, or quinoa. 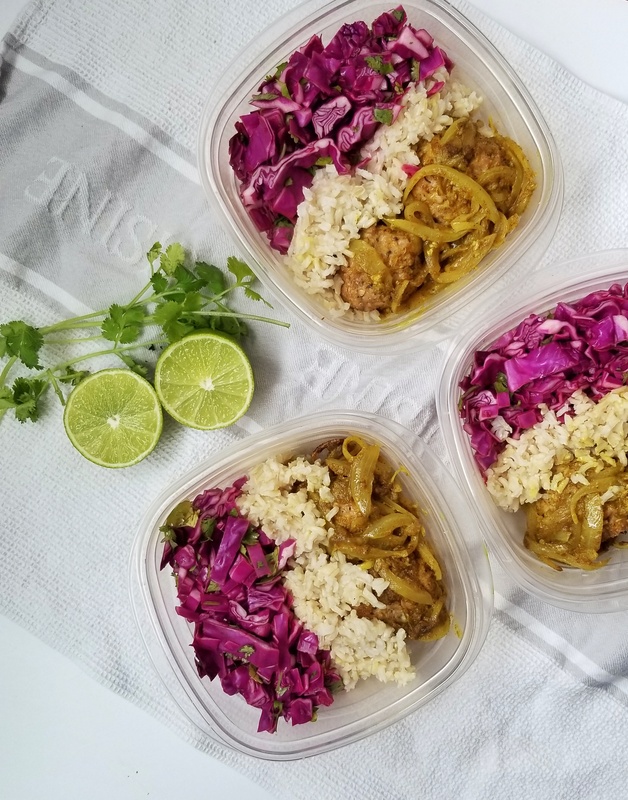 If you are meal prepping, add 2 – 4 meatballs, 1 cup cabbage salad, and 1/2 cup of rice/quinoa evenly between containers and refrigerate for up to 4 days.